Abstract: Health care reform has evolved over the past few decades, but one constant in this transformation has been Section 1115 waivers. These waivers broadly permit states to conduct “Medicaid research and development” programs to better meet the health care needs of their unique populations. Thus, the onus of health care reform is shifted to the states, accelerating innovation and transformation. The common thread of 1115 waivers is the enablement of states to pilot innovative and experimental approaches, granted they align with the mission and vision of Medicaid and/or CHIP. This alignment is formally evaluated by HHS to ensure operations under the waiver improve care and do not lessen coverage. More specific evaluation criteria include the promotion of coverage for low-income individuals, increased access to care, increased efficiency and quality of care and improved health outcomes (as measured by quality measures). Evaluation of waivers occurs not only at waiver application submission, but regularly throughout the demonstration period to measure impacts and outcomes of the program. In addition, since waiver programs are jointly funded by a federal and state match, waiver operations must be budget neutral to the federal government, meaning the cost of operations under a waiver cannot exceed the projected Medicaid spend without the waiver. The final point above, delivery system reform, is particularly interesting due to its ability drive larger health system transformation. A subset of states that have submitted 1115 waivers have a component to address this issue, generally coined the Delivery System Reform Incentive Payment (DSRIP) program. In this brief, the focus will be on state programs that COPE Health Solutions has worked extensively with, specifically California, New York, Texas and Washington3, but with a nod to other states with approved past and current DSRIP programs, including Alabama, Arizona, Massachusetts and New Jersey. DSRIP programs provide states with funding to incentivize hospitals and other provider types to provide better and more cost-effective care to Medicaid beneficiaries. 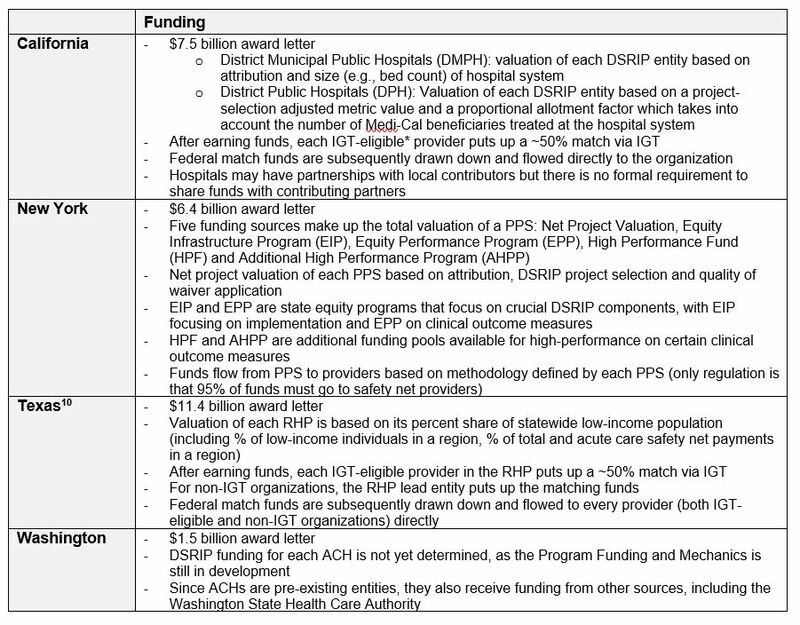 By definition, DSRIP is an incentive-based funding program, thus participants draw down dollars from the state by meeting predetermined implementation milestones and clinical outcomes, as outlined in “projects” that guide the work. Although trending towards similar goals, DSRIP has been approached differently state by state, especially as the programs have evolved and adapted learnings from other states. Of the states explored in this brief, California was the first DSRIP program approved, followed by Texas, New York and then Washington, correlating roughly to the intricacy of each program. The key differences among these programs fall into four major buckets: timeframe, regional structure and organizational authority, eligible participants and funding. Most waivers are approved for an initial five-year period, after which states can apply for a renewal (typically three years) to continue operations. The ACA allows five-year renewals when the state-focus is on dual-eligibles. See Table 1 for state-specific details on DSRIP timeframes. Within each state’s DSRIP program, the regional structure and organizational authority varies greatly, from individual hospital systems to complex networks of clinical and community-based providers. Table 2 details some of the key differentiators in each state. 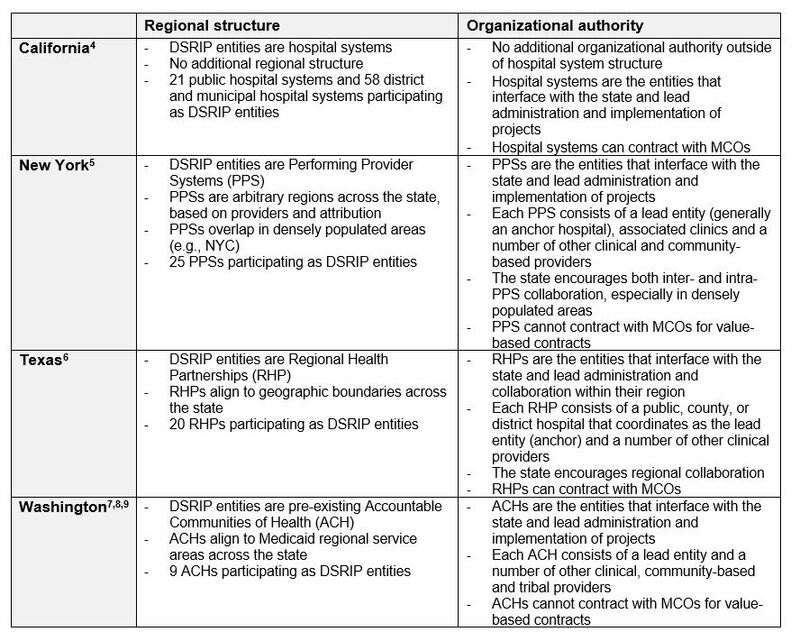 Just as the regional/organizational structures of DSRIP entities vary state-by-state, so too do the eligible participants that can partake in DSRIP projects and receive funding, the details of which are discussed in Table 3. Applicable participants were designated by each state to best meet the needs of their target populations, including Medicaid beneficiaries in all cases, but also varying degrees of dual-eligibles, uninsured and even Medicare beneficiaries. Upon approval of an 1115 waiver, the state is issued an award letter which displays the total funds available for DSRIP program implementation. 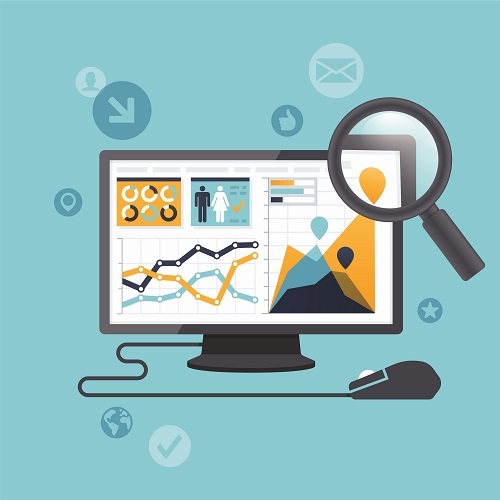 The mechanisms by which a state values and provides funds to each DSRIP entity vary state-by-state, but all require some degree of regular reporting on milestones and metrics by the DSRIP entities to earn dollars, in addition to state-collected claims data on clinical outcome measures. Reporting on implementation progress, thus, plays a role as a payment driver alongside actual performance on clinical outcome measures. Most DSRIP programs have a breakdown of P4R (pay-for-reporting) and P4P (pay-for-performance) components tied to varying dollar amounts. These components are critical as DSRIP funds are performance-based incentive dollars, not guaranteed grants. Also diverse is the process by which the lead/anchor organization of a DSRIP entity flows funds from the state to the other providers within the entity. Table 4 details some of these key differences. COPE Health Solutions is a national health care consulting firm with extensive experience in health care and population health strategy, including Medicaid waivers and DSRIP. With corporate offices in Los Angeles, New York and Seattle, the COPE Health Solutions team is filled with a diverse range of subject matter experts that can assist hospitals and health care systems be successful in value-based payment environments. For more information, please contact info@copehealthsolutions.com.